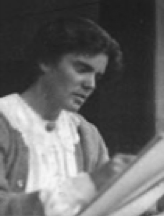 Frances Darwin Cornford was an English poet who was a member of the famous Darwin-Wedgewood family. Her ancestry began in the 18th century with Doctor Erasmus Darwin and the founder of the world-famous pottery firm in the English midlands, Josiah Wedgewood. Other notable members of this family line included her grandfather who was the well-known British naturalist Charles Darwin, along with at least ten Fellows of the Royal Society. Many prominent artists and poets sprang from the family including the composer Ralph Vaughan Williams. It was five more years before Spring Morning, her next collection, was published and four more volumes followed including Autumn Midnight in 1923 and Different Days in 1928. Her 1934 collection, Mountains and Molehills, was illustrated with woodcuts by the artist Gwen Raverat, who happened to be one of the author’s cousins. Her final set of original poems was published in 1948 with the title Travelling Home. Collected Poems, an anthology of her work, appeared in 1954. Just one year before her death Cornford was awarded the Queen’s Medal for Poetry, in 1959, in recognition of her life’s work. Frances Darwin Cornford died in Cambridge on the 19th August 1960 at the age of 74 and she was buried in the Ascension Parish Burial Ground which is where many of the academics and non-conformists of Cambridge ended up during the 19th and 20th centuries. It was fitting that this should be her final resting place, having grown up and lived for much of her life in and around Cambridge. Her obviously deep love of the town and its academic traditions shine through in many of her poems.